Stroganina ice cream, pigeon-liver tartare and bird cherry cake were just some of the culinary delights served up during the 2nd Omnivore Food Festival in Moscow. As conceived by its French creators, the Omnivore Food Festival is an international festival of young, fresh and original cuisine. “It’s a well-established cliché that cooking is boring. But it’s not true! You just need to step outside your usual comfort zone, find something new, and, of course, respect the ingredients,” said Natalia Palacios, a food journalist and organizer of the Moscow festival. The festival began in Europe in 2005, but this year marked just the second time the Omnivore festival has taken place in Moscow. This year's festival, which took last month, was a truly international occasion. 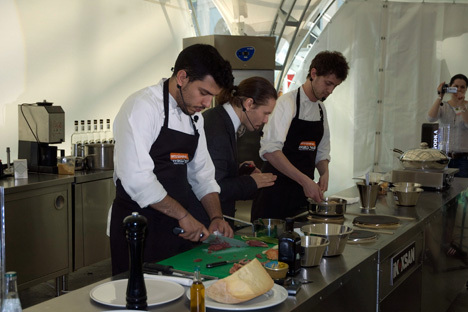 Before the Moscow event, master classes with the world's most famous chefs were held in Brussels, Geneva, and Paris; events in Shanghai, New York, San Francisco, Rio, and others are still to come. Twelve cities will participate in all. “Join the young cuisine!” is the rallying call of the festival program. Some of the youngest participants were Michael Greenwold from England and Simone Toldo from Sardinia in Italy. Both are under 30 and are have plans to open a restaurant together in Paris – French is their common language. “It will be something like a ‘gastro-bistro’ — four meals for €35 ($45). The restaurant will open in early June and will be called Roseval, after the potato of the same name,” said Greenwold. This is Greenwold's second visit to Moscow. Last year, he performed at the festival with Swedish celebrity chef Peter Nilsson of French restaurant La Gazetta. This year, the Anglo-Italian duo of Greenwold and Toldo served up another mishmash of languages, cultures and food. They prepared Krasnodar pigeon-liver tartare with mashed celery root, walnut crumbs, and salt pike caviar. The pike caviar was the result of a trip to the Dorogomilovsky market, where the foreign chefs were taken by festival organizers. “The search for new ingredients is the main reason why foreign chefs are drawn to Russia,” said Palacios. Wafer-thin apple tart is another gastronomic delight that migrated from the market to the festival table. This time around, it was used as a dessert by Bart de Pooter, Belgium’s top chef according to the 2012 Gault Millau rankings. “I invited Bart de Pooter to take part in the festival because his cooking is the very essence of avant-garde,” said Omnivore festival founder Luc Dubanchet. “In Belgium, there are two kinds of chefs: the old guard, whose style is classical and somewhat high-brow, and those aged 25-30, who travel a lot, experiment, and have a nose for new products and ingredients,” de Pooter said, as he began his master class. Although no longer 25, Bart belongs in the second category. At his restaurant, Pastorale, he updates the menu every five weeks, taking the seasonal vagaries of nature as his inspiration, awakening new feelings, and turning all conventional ideas of nature itself upside down. The current trend for all things natural was on display in Moscow as de Pooter treated spectators to cauliflower couscous with king prawns, which went down well. In total, seven foreign chefs made the trip to the Russian capital, while a dozen of their Moscow colleagues introduced a special menu in their restaurants to mark the occasion.